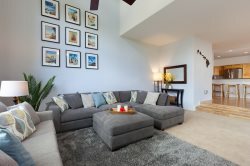 Shores at Waikoloa #306 is your home away from home! When you arrive to this beautiful 2 bedroom/2 bathroom condo with desirable top floor location it has all the features and amenities you are looking for to enjoy the perfect Hawaii Vacation. Take the elevator up to the third floor and enjoy sweeping views overlooking the golf course, carved out of ancient lava fields and breathtaking sunrise views over Mauna Kea Mountain. The large wrap around lanai captures relaxing breezes with a glimpse of ocean vistas to take your breath away and includes an outdoor wet bar and gas grill for outdoor private entertaining with a table for 4. This open concept condo includes abundant windows to catch those amazing views from all sides and vaulted ceilings to provide a cozy yet spacious home away from home. The gourmet kitchen comes with high end features and everything you need for your home away from home. Two generous size bedrooms, one with a king bed and a 32 inch TV with cable and one with a queen bed and a 25 inch TV which also offers cable; bedrooms are located at opposite ends for enhanced privacy with their own attached full bathrooms. Charming furnishings decorate the open living space with plenty of room for all including a queen size sleeper sofa. This unit offers free WiFi and a washer/dryer in the front hallway. Shores #306 is well equipped with beach chairs, boogie boards, coolers, umbrellas, tennis rackets and more! You have 1 reserved parking space (#306) right outside the building and plenty of visitor parking as well. The Shores is a gated community that boasts immaculate landscaping with water features. Amenities include a shared pool, hot tub, tennis courts and fitness center. The Shores is centrally located within Waikoloa Beach Resort, conveniently close to the white sand beaches, world class golf, shopping and dining at Queens Marketplace and Kings Shops, and the luxury hotels with all their amenities are nearby. The Shores is very close to 'Anaeho'omalu Bay ('A-Bay') along the Kona/Kohala Coast, where you can enjoy the Pacific Ocean at its finest. It's the perfect spot for anyone who wishes to experience the warmth and beauty of Hawaii in a quiet and relaxing atmosphere.